If you, as an independent retailer think that most of your prospective customers know your business, think again! This recent survey tells a different story. "My store is in a small town, so everybody already knows me and my business." This is an all too common myth encountered when talking with independent furniture retailers. Using this knowledge to your advantage means you can grow your business without opening new stores or expanding to new territories. To win hearts and minds, no matter the size of your market, you must fight to win the attention and business of your neighbors just as diligently as if you picked up shop and moved to a new location. Acknowledging you must reach out to prospects, whether your business operates in a small, medium or large market, is the first step in expanding your pool of customers. 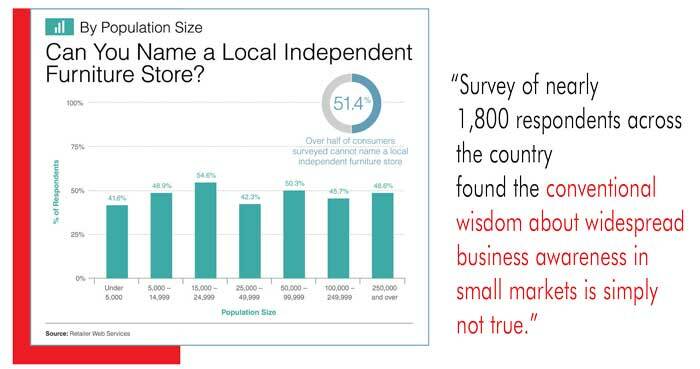 And while there are literally hundreds of ways to market your furniture business, in-depth discussions on the research findings with independent retailers led us to develop “11 surprising things" you can do now to win customers in the digital age. About Jennie Gilbert: Jennie Gilbert is the Chief Operating Officer of Retailer Web Services, a Scottsdale, Ariz.-based company whose mission is to help independent retailers realize their dreams through the promise of technology. Jennie is a frequent speaker at durable goods retail conferences and the co-author of RE:THiNK: 11 surprising things you should do now to win retail customers in the digital age (Retailer Web Services, 2015), available on Amazon and at www.retailerwebservices.com. Furniture World is the oldest, continuously published trade publication in the United States. It is published for the benefit of furniture retail executives. Print circulation of 20,000 is directed primarily to furniture retailers in the US and Canada. In 1970, the magazine established and endowed the Bernice Bienenstock Furniture Library (www.furniturelibrary.com) in High Point, NC, now a public foundation containing more than 5,000 books on furniture and design dating from 1620. For more information contact editor@furninfo.com.